Today’s post is going to be a bit more real life. I’ve mentioned a few times recently that I’ve been struggling with having a positive attitude, but if I am completely honest, it is a bit more than that. I went through a break up right before Christmas and for while I’ve just been flat out struggling. At the end of the day, I know that I have a lot to be happy about and thankful for, but that just has not been enough to keep my mood up lately. I’ve always been a realist and don’t usually shy away too much from my emotions, but this experience has been a bit different than I’ve ever had before. There have been so many times when someone would ask if I was OK, and I felt compelled to brush it off, and say yes, when I really, truly wasn’t. I felt myself judging or criticizing myself over getting upset over what I deemed as silly things or at really inopportune times. Umm WOW. How many of us take pride in mastering these habits? I do believe in the power of being positive, counting your blessings and so on and so forth, but I don’t know that I’ve ever truly looked at it this way. I just knew deep down this time around that I was going to need some time to feel these ‘bad emotions’ that she describes and didn’t want to feel like there was pressure to be OK anytime soon. This stuck with me the most, because it also resonated with other stages of my life. I’ve always believed and accepted that sometimes, to get to where we want to be, we have to do hard things. If I say that I don’t usually shy away from my emotions in other areas of my life and other obstacles, then why should this be treated any differently? I do not believe in or follow the line of thinking that “Everything happens for a reason,” but this, the thought that “discomfort is the price of admission to a meaningful life,” is one that makes sense and feels real to me. 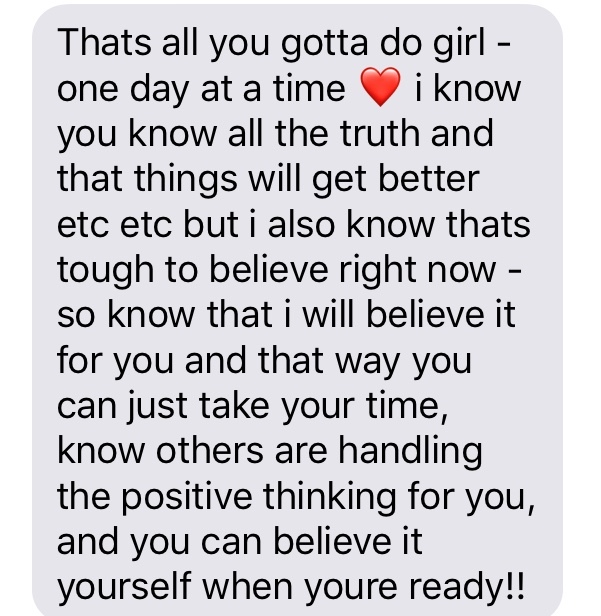 Before I saw the Ted Talk, I also got this text from a friend that fit so perfectly with the lesson and was a way of looking at things and leaning on friends that I had never thought of before. So this is me saying to others, I’ve been there too, and I get it… AND, take your time and let yourself feel all the things that you need to. The rest of us will do the positive thinking for you until you’re ready.